Jack Densing, winner of the $500 No-Limit Hold 'em Bounty event. 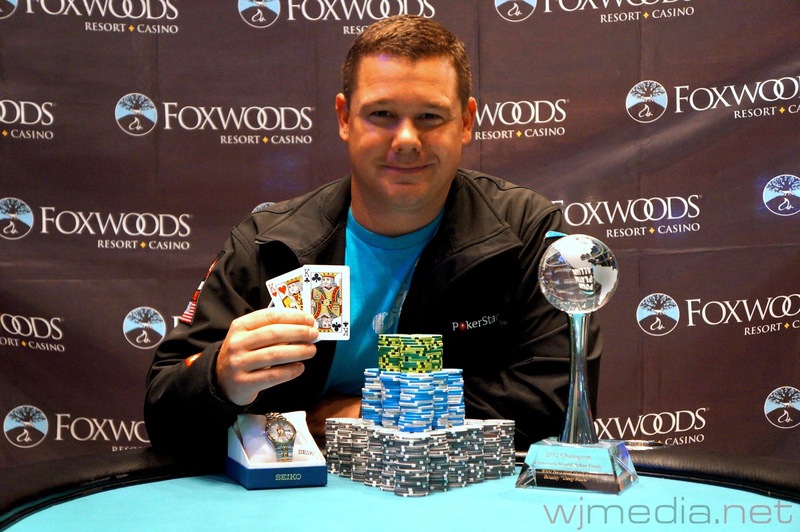 Jack Densing has won the $500 No-Limit Hold 'em Bounty event at the 2012 Foxwoods World Poker Finals. After a six-way chop that locked up $8,000 for each player, Densing and Aaron Eberly then split the remaining prize money once heads-up play began. They then played it out with Densing winning the World Poker Finals Trophy and watch. The final six players in the $500 No-Limit Hold 'em Bounty event have come to an agreement on a chop. The six are all locking up $8,000 each with the winner taking home an additional $4,693 plus the World Poker Final Trophy and watch. You can watch the final table play out live by clicking on FoxwoodsLive.com. $500 Bounty Final Table Now Streaming Live! We have reached the final table of the $500 No-Limit Hold 'em Bounty Event. You can watch the live stream by clicking on www.FoxwoodsLive.com. We had a total of 454 players in today's $600 No-Limit Hold 'em at the Foxwoods World Poker Finals. The final 54 spots will finish in the money. There are currently 390 players remaining with the blinds at 100-200 with a 25 ante. 22.5k from 20k start. On first break coming back to 75/150. Nitty table draw. Sick structure with 50 min levels.